You are being offered a trial of CPAP therapy. 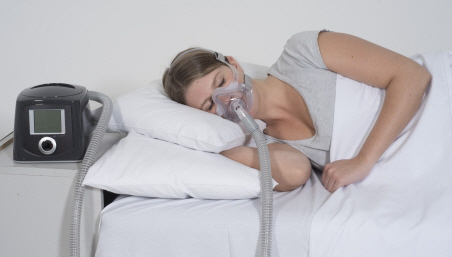 CPAP is a machine that treats obstructive sleep apnoea (OSA). CPAP stands for continuous positive airway pressure. Normally when you go to sleep, your throat muscles hold your airway open. If you have OSA, your throat muscles relax too much when you are asleep. This causes pauses in your breathing. Often people are not aware that this happens. Untreated OSA can affect your long-term health. It can cause problems with blood pressure, diabetes, heart attack, stroke and heart failure. What can CPAP do for my sleep? A CPAP machine blows air through your nose (or nose and mouth) into your throat area. The airflow supports your throat muscles and keeps your airway open. This prevents the pauses in your breathing and helps you sleep better. Sleeping better stops you feeling as tired through the day and improves your overall health. CPAP is only a treatment for OSA, not a cure. There is currently no cure for OSA. But losing weight and making some lifestyle changes may help to improve your OSA and quality of sleep. What is involved in a CPAP Trial? You will have an appointment at Christchurch Hospital's Sleep Unit. The Sleep Unit will give you a CPAP machine to try for one to two weeks. They will also fit you with a mask. Don't adjust the CPAP machine's air pressure yourself. The Sleep Unit will make a second appointment for you. If you live outside Christchurch, they will make other arrangements. During your second appointment, the Sleep Unit will check how things are going. You will take a monitor home to measure your overnight oxygen levels. This will make sure your CPAP machine is working the best for you. Once everything is stable, you will keep the CPAP machine to use long term. Your DHB will pay for the machine. In approximately 12 months you will have an appointment with the sleep nurse specialist. The nurse will review your CPAP therapy and discuss any problems you may be having. The Sleep Unit's engineer will check your machine and you will get a replacement mask. If everything is going well at this point, the Sleep Unit will discharge you. You will receive a CPAP care package that will include details of all your follow-up contacts. The community provider, USL Medical, will provide long-term follow-up. They will replace your mask annually and support your ongoing CPAP use. Your GP will look after your health needs as usual. If any concerns arise, your GP can refer you back to the Sleep Unit. If you have more complex issues, you may receive long-term follow-up from the Sleep Unit. This map shows the Sleep Unit's location. To contact the Sleep Unit, phone (03) 364‑1089 or email sleep@cdhb.health.nz. Messages are checked regularly.